Amazon Price: $39.95 $29.95 You save: $10.00 (25%) (as of April 19, 2019 2:16 pm - Details) Product prices and availability are accurate as of the date/time indicated and are subject to change. Any price and availability information displayed on the Amazon site at the time of purchase will apply to the purchase of this product. The tape consisting a copper foil backing coated with conductive acrylic pressure sensitive adhesive. - Ideal for transformer, mobile phone, computer, PDA, PDP, and LCD monitor, PC, copier etc. 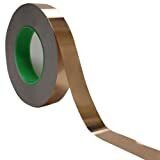 - Self adhesive copper foil tape used in fridge, air conditioner, automotive, bridge, hotel, electronic industry etc. Pity they don’t sell it by the yard! What to do with 55 yards?